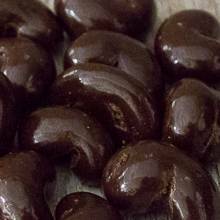 Creamy cashew nuts with a hint of sea salt, coated in rich dark chocolate not only sound delightful, but are also the perfect blend of sweet and salty. Price quoted is per pound, not including shipping. Ingredients: Dark chocolate (sugar, cocoa mass [processed with alkali], cocoa butter, butter oil, soy lecithin, vanilla), cashews, sea salt, sugar, tapioca syrup, tapioca dextrin, confectioner's glaze.